Strawberries again this week, and they don't look to let up. I checked our harvest for last year at this time. Though we are way ahead in total amount (thank you lemons! ), we had more variety last year. Strawberries (!) and peas and sweet peppers. Interesting. And so far this year? I'm thinking this will be a strawberry week again. Strawberry pie for 4th of July anyone? I love the idea of strawberry pie for the 4th or any time really. Beautiful harvests. I am happy to hear that you are ahead of your harvest totals from this time last year. I'm jealous! 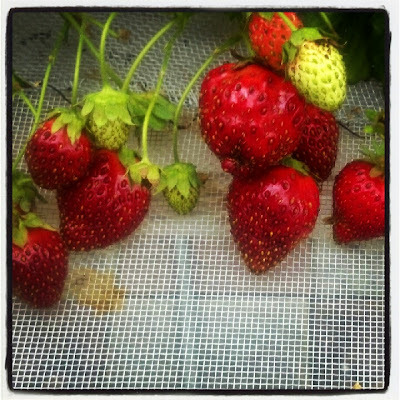 We grow ever-bearing strawberries but they always take about 6 weeks off this time of year so we are "in-between" crops and missing them!! 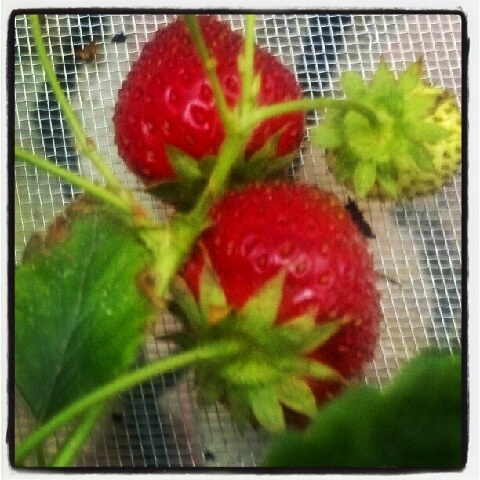 My strawberries are coming in with only small amounts at any given time. Enough for fresh eating but not enough to do jam, certainly not a pie, and no freezing. 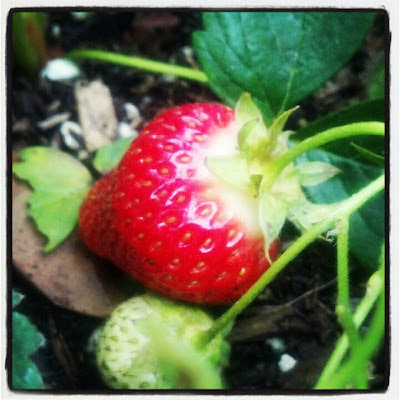 Our berries are coming SLOWLY suddenly. I'm not sure if we're losing them to birds or what. Oh yum, I always struggle to get any strawberries. If the birds don't eat them the slugs do and if they miss them then the kids find them. But this year I have a plan they are too high for both the slugs and kids to reach hopefully the birds miss them and I shall finally have a few myself. lovely berries! Mine are in a lull right now, but will have more soon I hope.